1. Make upward of the eyelashes by curler. Stop using in case of happening troubles on the eyes or eyelids. Everyone seems to love how Daiso has TONS of eyelashes to choose from so when my boyfriend visited, he grabbed me a few pairs too. This is just one of them. For my Daiso Haul post, please see here. In terms of the packaging, I find that its very average. Similar to typical Korean/China eyelash containers. Compared to Japanese Packaging, obviously, not as appealing. I also wished that they had better English translation. I typed it directly in the "Directions of Use" section, and you can easily pick out the errors. The package came with a glue, but I never really used it because I'm never too fond of glues that came with "affordable" eyelashes. These products are after all for our eyes, so I usually prefer to use my own lash glue instead. Packaging: 4/5 ♥ Japanese packaging still beats it. 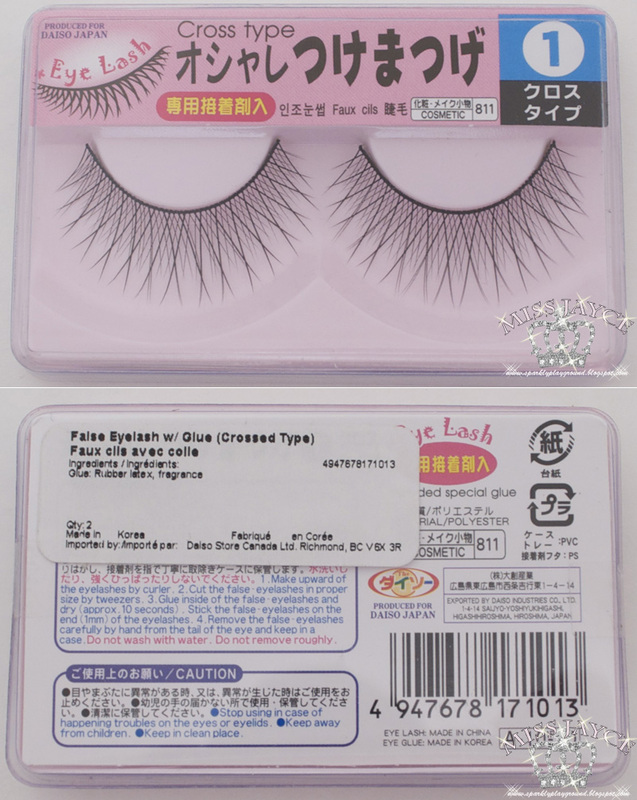 Price: 4.5/5 ♥ More expensive than $1 Ebay lashes but $2 isn't bad, it's good quality.